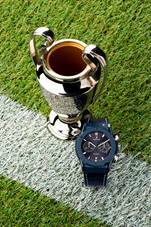 Official Licensed Watch Partner of the UEFA Champions League™, Hublot is the star watchmaker of the footballing world. 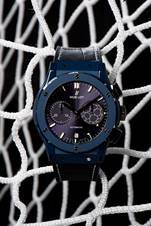 In its third year of partnership with the UEFA Champions League™, Hublot time takes on a total blue look. Whilst waiting to discover who will lift the trophy on May 26th, 2018 in Kyiv (Ukraine), Ricardo Guadalupe, CEO of Hublot and ‘King’ Pelé unveil the new “Official Licensed Watch” of the UEFA Champions League™. The world-renowned international football legend’s wrist sports the symbol of Europe’s biggest football club tournament. Because passion for football knows no bounds! Similar to the gods of time adorned in blue, Hublot has created a watch dressed entirely in the iconic color of the competition. The Classic Fusion Chronograph UEFA Champions League™, the competition’s “Official Licensed Watch” distributed by Rick De La Croix, features an imposing 45 mm case in satin-finished and polished blue ceramic. The alligator leather strap is in a matchless blue with white top stitching. The blue sunray dial displays the competition’s logo in tone-on-tone color: The renowned starball and its eight stars. The case back itself features the logo of the UEFA Champions League™. A benchmark in the world of football, Hublot is there for every match and every win thanks to partnerships with prestigious clubs as well as with FIFA and UEFA. The Swiss watch manufacturer distributed by Rick De La Croix is a fixture at all major football competitions. Alongside the biggest clubs, renowned star players, from the FIFA™ World Cup to the FIFA™ Confederations Cup and major European competitions, such as the UEFA Champions League™ and the UEFA Europa League™, Hublot has football running through its veins. 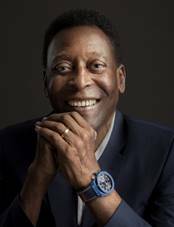 A Hublot ambassador since 2013, Pelé, a global citizen and football legend, embodies dreams and victory, and has a boundless passion for football. He is a three-times World Cup winner – a record still unbeaten – and twice champion of the Copa Libertadores, the most prestigious club competition in South America and the equivalent of the European UEFA Champions League. The football adventure continues and Hublot looks forward to seeing you on June 14th for the kick-off of the 2018 FIFA™ World Cup.